First impressions are everything. Signs are one of the primary means by which businesses communicate with the public. After your location, your sign may be your biggest asset—or weakness. Customers learn about your business, make purchasing decisions and evaluate your products and services based on your signage and storefront presentation. Whether you promote your business or stay in the background, potential customers who are ready to spend will be looking for your products and services. You don’t have to sacrifice increased profits to save money! Let ABC Signs show you how to spend your advertising budget wisely. Let the professionals at ABC Signs help you make the best impression possible. 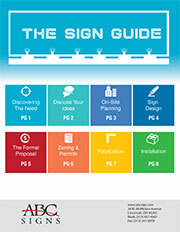 ABC Signs is here to make the sign buying process stress-free and painless with our downloadable guide.